The present. Burnow Island. Baxter Stockman is working tirelessly in a lab. He considers to himself how General Krang’s plan to terraform the Earth with the Technodrome and essentially eliminate human civilization is rather bad business. As Mousers aid him on his latest side project, he thinks about how he can overcome this problem. The past. Baxter is a small boy playing chess with his father in the park. 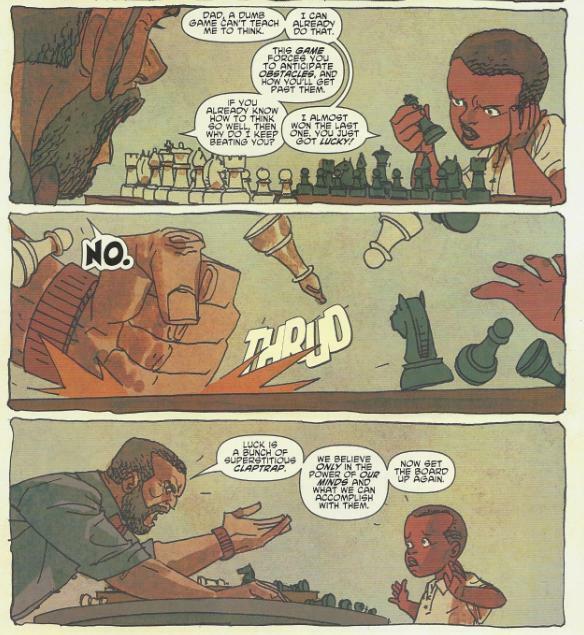 Baxter thinks the game is dumb, but Mr. Stockman insists that chess enhances one’s ability to think and problem-solve. Baxter suggests luck has more to do with it, enraging his father, who insists that outcomes are the result of a person’s mind and nothing else. The present. Baxter gets a message from Krang, who demands a status report. Baxter tells him that the Technodrome is proceeding on schedule. Krang is disappointed, as he wants the Technodrome completed AHEAD of schedule. Furthermore, he’s annoyed that Baxter is wasting time on a side project. Baxter claims that his “side project” is actually intended to speed up the construction of the Technodrome. He introduces Krang to the Flyborg, a combination of mutant fly and cybernetics. When built into drone units, it will be markedly more efficient than the current laborers. Krang offers Baxter a backhanded compliment and signs out. Baxter starts to lose his temper, but recalls what happens when one loses their cool. The past. Baxter, a teenager, is playing chess in the park with his father. Mr. Stockman chides his son on his slow move-making. Frustrated, Baxter makes a thoughtless move, setting himself up for defeat. Mr. Stockman warns him that getting angry causes an individual to make poor, self-destructive decisions. Baxter asks for a do-over, but Mr. Stockman reminds him that there are no do-overs in the real world. The present. As Baxter takes the Flyborg for a test run, he considers his many options; most of which end in his loss of “the game”. A unit of Rock Soldiers stop him and demand to know what his creature is. The Flyborg suddenly shows a burst of sentience and free will. Speaking, it says that it does not want to be an expendable slave and rebels. Baxter’s override systems fail and the Flyborg takes down all the Rock Soldiers. Baxter flees for his life, contacting Krang and asking him to send more guards and to guide him to a saferoom. Krang laughs at Baxter’s misfortune and offers his help, but only after Baxter debases himself for the General’s amusement. Baxter takes shelter in the heavily fortified control room, but the Flyborg enters through a ventilation shaft. Upon entrance, it destroys all monitoring equipment. Seeing his carefully laid plan a success, Baxter initiates his true override protocols, incapacitating the Flyborg. As it happens, the entire Flyborg project and rampage was Baxter’s design. Now with complete access to the control room and no one looking over his shoulder, he downloads all information regarding the Technodrome and Krang’s many nefarious schemes. Once he gathers all he requires, Stockman feigns helplessness and draws the guards to the control room. The Flyborg begs to be spared, but the Rock Soldiers kill it. Later, Baxter goes over the files he downloaded and is disturbed by Krang’s plans. The files contain enough data that he can use to seize control of the Technodrome, but he can’t do it alone. Looking over a profile of the Fugitoid, Baxter thinks he can manipulate the robot into helping him. Smiling, Baxter believes he has Krang in check. The past. Baxter, an adult, meets his father for a game of chess in the park. Before even playing, Baxter tells his father he has him in check. He then presents Mr. Stockman with documentation of a hostile takeover that gives him complete control of Stockgen, ousting Mr. Stockman. Mr. Stockman can’t believe his own son would do this, but Baxter simply knocks over his father’s king, saying that he taught him everything he knows. *As the events of TMNT (IDW) #20 are referenced and Krang has fully healed, I would place this issue after TMNT Villains Micro-Series #1: Krang. *This issue was originally published with 2 covers: Regular Cover by Tyler Walpole, and Cover RI by Kuhn and Daniel “PeZ” Lopez. The origin of Baxter Stockman; that’s a tough one to retell. You see, “Insane in the Membrane”, the notorious “banned episode” of the 4Kids TMNT series, was pretty much the essential Baxter Stockman origin. It was also one of the best Ninja Turtle stories ever told. So the idea of an author going back and doing a new origin for Baxter left me a tiny bit incredulous. How do you top “Insane in the Membrane”? 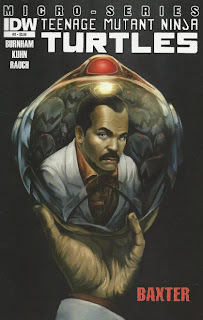 Well, I wouldn’t say that Burnham tries to "top" that story, but he does offer a very fitting glimpse at the origin for this universe’s Baxter Stockman. Burnham opts to focus on Baxter’s relationship with his father (whereas the 4Kids episode focused on his relationship with his mother) and the lessons he learned which shaped him into the super villain he is today. The flashbacks are rife with subtleties in Baxter’s upbringing that I felt offered quite a bit of depth for 3 whole pages. Baxter’s dad is caring (taking the time to teach his son valuable life lessons and improve upon his natural intellectual gifts), but unforgiving (he vocally attacks Baxter for every poor decision and denies excuses or second chances). 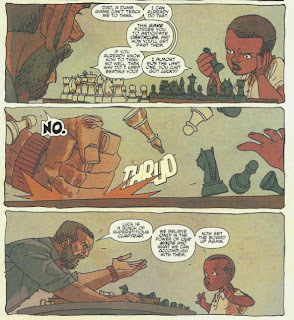 He’s profound (likening the numerous nuances of chess to practical values), but contradictory (losing his temper when Baxter mentions luck, then telling him never to lose his temper because that breeds mistakes). There’s a surprising richness and sincerity to their relationship that, again, packs a lot into just 3 pages. The broader details of Baxter’s relationship with his father are unknown to us, but we can see in that last page that he resents him to some degree (enough to steal his company). Whether this was supposed to imply that Baxter was naturally a corrupt individual or if he despised his father’s unflinching parenting and that’s what corrupted him (he uses what he’s taught against his father), there isn’t enough material to really say, but I think we all get the gist of it. And it doesn’t necessarily contradict any of the origin material from “Insane in the Membrane”, either. There’s no telling what Baxter’s relationship with his mother was like in IDW or if she died when he was young as in the 4Kids cartoon (and perhaps being raised exclusively by his demanding father without the softer guidance of his mother is what “turned” him). I don’t mean to sound like a stickler for older material, and I know I shouldn’t be actively comparing these new stories to what’s come before, so please forgive me for that. I just feel that you can effectively combine both origins together and come away with an even fuller picture of Baxter’s personal history than before. As for the present-set stuff, we get a blunt reference to Baxter’s fly mutation from the Fred Wolf cartoon in the form of the Flyborg, but it’s not particularly bothersome. Baxter commanding an army of Mousers and Flyborgs, combining his two most notable character traits from earlier incarnations, is a fun prospect and I look forward to seeing his machinations develop. 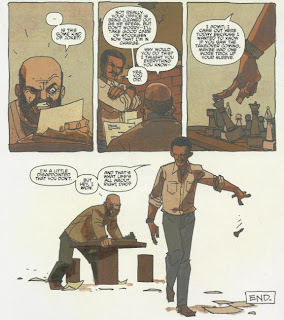 While Baxter comparing all his actions to a game of chess is a bit of a cliché, it works alongside the flashbacks and I enjoyed the opportunity to see how his thought process worked (going over his various options and their various outcomes several moves in advance, so to speak). In a way, it kind of reminded me of April’s microseries issue, where we got a peek into her noggin and witnessed how she weighed and considered actions preemptively. Considering the close ties between April and Baxter, the similarities paint a rather interesting picture as to how they mirror one another. Andy Kuhn is back on art duties. Not to beat a dead Mouser, but I feel compelled to reiterate that the primary grievance with Kuhn’s work on IDW’s TMNT books (from myself and, as I’ve witnessed, many fans online) has been the way he chooses to render the faces of the Turtles. Now, give us an issue with no Turtles in it (save a one-panel flashback) and what do you end up with? A clear look at Kuhn’s art without that one negative element distracting you from processing his work. And he’s really very good. The characters are expressive, the action flows nicely and he uses space exceedingly well. His panels never feel cluttered, but nor do they feel empty. He only employs as much background detail as is needed to tell the story so your focus is never lost. The guy has grown considerably since his debut on the Michelangelo micro-series. I’d also like to point out that the cover by Tyler Walpole is quite possibly the most perfect image of Baxter Stockman I’ve ever seen. It says so much about the character. His look is intense and reflective (ha ha) as he ponders the Mouser in his hand, denoting his intelligence and focus. Yet he’s also menacing, frightening, not only because of his intensity, but because of the eerie creations that swarm at his back. Walpole’s cover is just a superb piece of art that really defines the character in one singular shot; very impressive. While this issue may not be notable for its action, as the “threat” of the Flyborg’s rampage is dampened by the advanced knowledge that Baxter is plotting the moves of a “game”, it’s a wonderful insight into the scientist’s brain. Even if you feel compelled to compare this origin with his 4Kids origin, you’ll find it acts more as a compliment than a contradiction and shows us a different side of the bad guy’s upbringing. There’s great subtlety in the relationships between the characters, even when their interaction is limited to just a few pages, and the art ain’t bad, either. A nice, if belated, second epilogue to the Krang War arc. Good review, Mark. Glad to see you reflecting back on the awesomeness that was Insane in the Membrane. I was especially intrigued by Baxter's reference to Mary Shelley and the Frankenstein monster. Most people tend to equate the doctor's name with the monster he created. With Baxter having a stockpile of Flybots waiting to be released, I do wonder if one or a few of those mutant monsters might succeed at breaking out of Stockman's control and perhaps becoming his surrogate in the future. 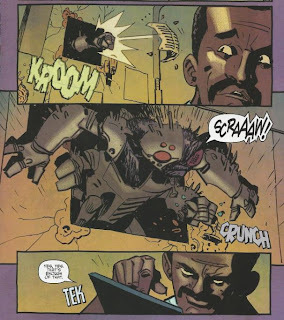 Although I do hope IDW keeps Baxter human and alive for a good while in this series, it is possible they might try to kill him off or pull the ol' mind transfer to new body angle. 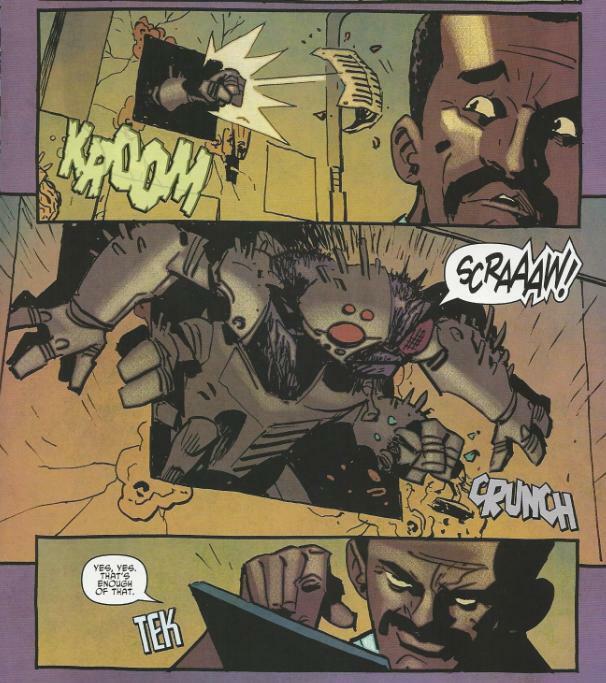 Is it possible that the name of Baxter Stockman might eventually be applied to both the doctor and one of the monsters that he created? i thought the exact opposite. as in being such a powerful robot, he would feel the need to transfer his mind to the robot in a "last resort" situation. Let's hope not, at least for the moment. I was thinking the same. And yes, mind transfer - as you both said... The fact that he's intrigued by the Fugitoid points even further in this direction. In my view they more or less eliminated the possibility of him becoming a mutant fly at least. But of course Adam might be right too.